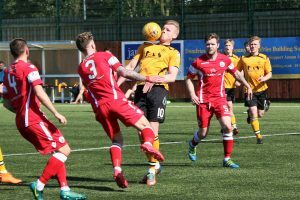 Annan Athletic completed their home fixtures in style with an impressive performance which secured a 3- 1 victory over play off candidates Stirling Albion at Galabank on a glorious spring afternoon. It was a game where ex Binos striker Blair Henderson grabbed the headlines when he came back to haunt his former team after the unorthodox striker grabbed a glorious hat trick to secure the victory for the Galabankies. The defeat leaves Stirling with more work to do if they are to secure a play off place after Clyde pushed themselves into contention with a 3-1 victory over Edinburgh City, which leaves the Binos having to get a result in their final league match at home to Stenhousemuir next Saturday. Annan boss Peter Murphy made one change to the team that were beaten by a last minute goal at Stenhousemuir with Connor O’Keefe starting the game in preference to Owen Moxon who started on the bench. Annan had to do it the hard way, having to come behind after losing an early goal in the 8th minute when Neil McLaughlin finished a well constructed move which cut open the Annan defence and ended with McLaughlin guiding his shot from 10 yards into the corner of the net giving Mitchell no chance. It was a bitter pill for Annan to swallow but gradually they worked their way back into the game and in the 21st minute Henderson scored his first of the afternoon with a glorious overhead kick which looped over Cameron Binnie and into the top corner of the net from the corner of the 6 yard box. The goal inspired the home team and 5 minutes later Connor O’Keefe finished a penetrating run with a glorious low raking shot which cracked the upright, this was followed when Blair Henderson’s effort went narrowly over the bar when he connected with Jack Brannan’s inviting low cross. Annan continued to pile on the pressure and in the 32nd minute Binnie pulled off a super save at full stretch when he pushed Brannan’s net bound effort round the post. Stirling were holding on but as the match approached half time Annan were still pushing forward and Aidan Smith was caught offside after a good move between O’keefe and Roberts set up the Annan striker. Stirling finished the half on the attack and efforts from Kevin Moon and Daniel Jardine went close as the visitors tried to grab the initiative. Annan started the second half with a bang and within 3 minutes Blair Henderson put Annan ahead for the first time in the game when he ended a good move involving O’Keefe and Roberts with a good finish into the roof of the net from 10 yards. It was blow to the visitors who tried to respond after Peter MacDonald’s well struck effort hit the side netting. Mitchell then pulled off a good save to deny Darren Barr in the 58th minute as the visitors responded to the task. It was however Blair Henderson who dealt the Binos a hammer blow in the 62nd minute when he put the final touch to an excellent Annan move between O‘Keefe and Roberts which cut open the Stirling defence to give Annan a 2 goal advantage. Stirling made changes in an effort to turn around their fortunes with 3 substitutes being introduced in the space of 5 minutes. Neil McLaughlin tested Mitchell in the 71st minute with the Annan keeper turning the effort round the post for a corner kick. Barr’s header then went very close in the 73rd minute as the visitors pressed hard for an opening. Annan used all their substitutes in a 5 minute spell with Moxon, Armour and Hooper all being introduced at the expense of Sinnamon, O’Keefe and Henry. In the closing minutes minute Evan Horne almost had the final say as he finished a surging run down the left with a brilliant shot, striking the underside of the cross bar. The victory ensures Annan will finish the league in 7th position and they conclude their final league match next Saturday at Cowdenbeath with the Fifers already being confined to the relegation play offs where they will face the winners of the Spartans versus Cove Rangers play off match. ANNAN ATHLETIC- Alex Mitchell (GK), Jack Brannan, Evan Horne, Jamie Henry ( Scott Hooper 78 min), Ayrton Sonkur, Steven Swinglehurst, Ryan Sinnamon (Owen Moxon 73), Connor O’Keefe ( Ben Armour 77 min), Aidan Smith, Blair Henderson, Scott Roberts. SUBS NOT USED – Jim Atkinson, Cameron Salkeld, Zak Hannay, James Creaney. STIRLING ALBION – Cameron Binnie (GK), Ross McGeachie, Lee Hamilton, Ewan McNeil, Darren Barr, Kevin Moon ( Ross Kavavagh 65 min), Neil McLaughlin , Daniel Jardine, Peter MacDonald ( Liam Caddis 69 min), Darren Smith, Willie Robertson (Sean Dickson 65 min). SUBS NOT USED- George Stanger, Andrew Black, Craig Wright, Ross Smith . Montrose now only need one point from their final league match of the season to secure the title when they entertain Elgin City next week after the Angus side recorded a fine 2-0 victory over Stenhousemuir at Ochilview . Peterhead are hard on the heels of Montrose after they defeated Elgin City by the only goal of the game. Clyde maintained their challenge for one of the play off places following their 3-1 victory over Edinburgh City . Berwick Rangers defeated Cowdenbeath by the only goal of the game.